The book sounds great. The contrast between the lawless areas of France verses postwar London are of particular interest. I can empathize with the children when they were displaced even though thier earlier life may not have been ideal. This sounds very intriguing Jacqui, especially since I am always drawn towards novels that are haunting and atmospheric. I don’t think I had heard of Rose Macaulay until I read your review, so it’s good to know that this is the one to start with. I think I first heard about Macaulay a year or so ago via Heaven Ali’s blog, possibly in a review of this very novel – I can’t quite remember now, but I’m sure that Ali has covered 3 or 4 or her books at various points in time. Macaulay’s also been featured on the Backlisted podcast run by Andy Miller and John Mitchinson. I don’t know if you’re familiar with that, but if not it’s well worth checking out. I’ve picked up lots of excellent recommendations there, particularly for novels from the mid-20th century, a period I love. Plus the relatively recent reissues from Virago have probably given this author a bit of a boost. They’re really beautifully produced, with much nicer covers than some of the other contemporary Viragos! Great review, Jacqui! This was one of my favourite novels a couple of years back. I agree that there is a sense of redemption to the story. Thanks, Juliana. I’m glad you liked it so much too. There’s definitely a feeling of atonement towards the end, an attempt to right the wrongs of the past. I liked that aspect of the ending. Your opening paragraph had me convinced Jacqui! This sounds great. The post-war, ravaged London setting is so appealing too. I’ve not read Macaulay but I’ll definitely be seeking this out. Excellent news – I think it’s right up your street! The portrayal of war-torn London is brilliantly done. Lovely post as always Jacqui. It’s wonderful that Macaulay’s being rediscovered, though I think she was extensively republished in green Virago some time ago – I have a few on my shelves including possibly this one (I know I owned an old Penguin of it once as well). It’s the evocation of post-War London which appeals to me particularly – I loved that element in the Ealing Film “Hue and Cry”, that sense of a place in the middle of a big change from the past into a modern future. I shall definitely need to pick this one up soon! Ah, I wasn’t aware that Virago had published this before in the old green livery. (I think I’d seen Told by an Idiot, but not this one.) You’re lucky to have some of them on your shelves, very covetable indeed. A lovely job. Your review is a well-tendered lawn to my overgrown garden: https://serenityscience.blogspot.com/2018/09/terrible-liberties.html. Poor Helen!…”Lax and casual”. Is she really so bad? Thanks! I’ll take a look at your post. Maybe I’m being a bit hard on Helen, but she does rather abandon Barbary at a very delicate age. I do think she comes through for Barbary in the end, but quite a lot of damage has already been done by that stage…Maybe we’ll have to agree to disagree on that one! I loved this one, it was my first Macaulay and I have now read several others. I loved the feeling of post war London with all the debris lying in the Streets etc. Lots of wonderful descriptions. Great review. Well, your enthusiasm for Macaulay was fully justified! I loved this too – such an affecting little novel with a brilliant feel for the period. Great. I’ll be very interested to see what you think of it. Macaulay’s tone/style takes a bit of getting used to — I can imagine some readers finding it slightly precious — but it seems to work well within the context of this story. There’s a good chance you’ll like this one, Simon, especially as you’ve already read a couple of her others. This sounds interesting and msny of the themes highly relevant to today. It never ceases to surprise me how many aspects of novels written in the 1940s, ’50s and ’60s still feel quite relevant in the current environment. The contemporary resonances are often very striking. In terms of the Macaulay, it’s the sense of abandonment and dislocation that stands out. Even though the context has changed since the end of WW2, the emotions Barbary experiences would still hold true today. Lovely review. I was sure you’d like this as well. I absolutely loved it. The descriptions are wonderful. Oh, I’m so glad to hear that you loved it! (I don’t think I was aware that you’d read this one.) Did you ever write it up, Caroline? If so, please feel free to leave a link to your review. I’d love to see what you think. And yes, the descriptions are so vivid and evocative, from the wilds of Collioure to the bombed-out buildings of London. Even the descriptions of Barbary’s brief visit to the Scottish Highlands are alive with beauty. I did review it. I’ll add the link tomorrow if I don’t forget it. All the settings are great. 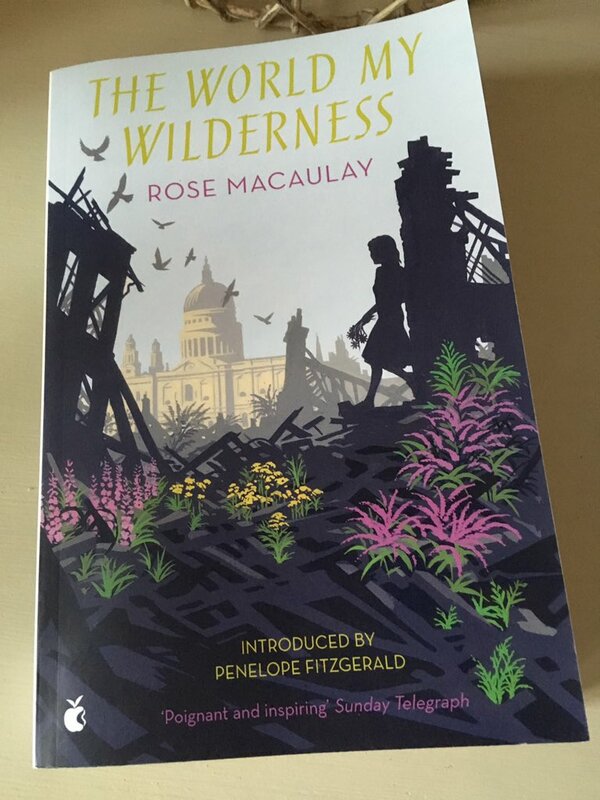 Check out the book, The World My Wilderness by Rose Macaulay, as featured in this post from Jacqui Wine’s blog. Thanks for sharing my review, very kind of you. Must say thank you for this fantastic review of a book I’ve dithered over too long. I’ve finally bought it thanks to you and I’m sure I’m going to love it ! Oh, you’re very welcome, Maureen! Thank you for dropping by to let me know – it’s comments like yours that make these reviews seem worthwhile. I do hope you enjoy the novel as much as I did. This sounds like a nice read, very evocative from those quotations. You seem to have rich pickings at the moment, lots of undiscovered gems on the shelves. Lovely review, as always. Thanks, Belinda. I’ve been on a bit of a mid-20th-century kick recently, and this book falls firmly within that territory. Macaulay appears to be a good ‘discovery’ for me.